I purchased these at Costco a couple weeks ago. Read to find out why I have a mixed opinion. Product Description: Dehydrated hash brown potatoes prepared by adding hot water then cooking on the stove top. 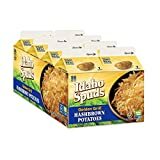 I purchased a case of these potatoes while at Costco a couple weeks ago as a spur-of-the-moment purchase for my family and my wife ended up preparing one of the packages this past weekend as part of a family breakfast. One of the unexpected benefits of signing up for a Costco membership is I have been able to find quite a few products I never even knew existed before. And, while this does usually mean I end up going over my grocery budget whenever I shop there, I have found some good buys as a result. One purchase I made recently was Golden Grill Hashbrown Potatoes. I, personally, am not a huge fan of hash browns. But, my family is and this product was affordable enough to give it a try. Unfortunately, when it was all said and done, I did end up having a bit of a mixed opinion about this purchase. I'll start out by saying there is a lot to like about this product. One thing, in particular, that attracted me to it right away was the space-saving design. Our freezer space is pretty limited (especially since becoming Costco members) and, because of that, frozen hash brown potatoes are a little hard to store. These containers, in comparison, take up very little shelf space in our house. And, since they are dehydrated, they do last a relatively long time. I was also surprised by the taste. Based mostly on how this product was stored, I was expecting the potatoes to be very salty. That, however, was not the case. They had some salt. But, it wasn't anything that was too strong and, while it was obvious they weren't fresh, I really didn't notice any difference in taste between these and frozen varieties. Another thing that impressed me about this product was the quantity. When I read it made 7 servings, I had a hard time believing that description because the package wasn't very large. But, we did have leftovers. My biggest complaint about this product is convenience. When I first purchased this, I figured they would be something that could easily be prepared on a hectic school morning. That, however, was not the case. Preparation requires adding hot water to the dried potatoes and letting it sit for 12 minutes before draining and finally cooking. While this is OK on a weekend, when we have plenty of time to make breakfast, the prep time alone eliminates this as something I would want to make on a busy morning. And, as a result of that, I did end up giving away about half the packages we purchased simply because I knew we would never get through them. As I said, this product does have a decent taste and makes quite a bit of potatoes for the money. However, because of the long prep time, it's not something I would recommend if your mornings are hectic. And, even on slower days, I'm not sure if it is really much more convenient than just cooking fresh potatoes. A review of the frozen breakfast item I purchased last week for less than $3.